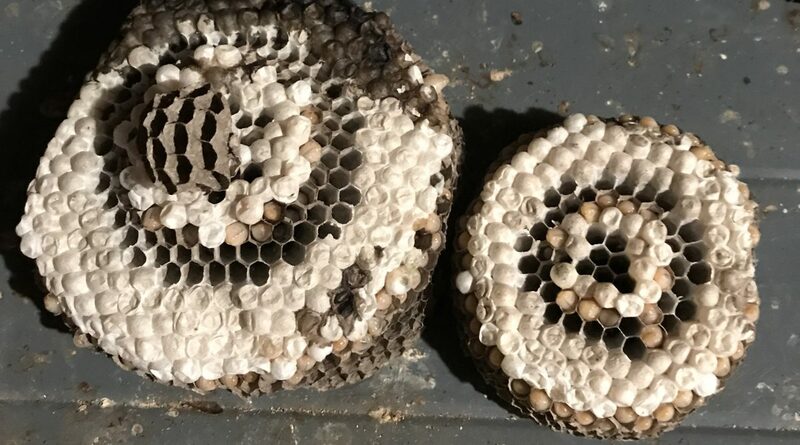 We have more than 40 years of experience in the removal of wasp, yellow jacket and hornet nests. Bald Face Hornets (d Maculata) nests as of today have lost the long entrance straw and the first brood of 12-15 insects are emerging as new adults, albeit small for hornets as they are relatively starved having only the queen feeding as well as building the nest. From now on the new workers, all female, will do all the work including chewing wood to make paper to expand the nest, hunt for meat, mostly other insects, to feed the eggs and larva, and the queen mother will stay home and lay eggs. Also the new workers will begin to defend the nest with their stingers. Vespids can sting multiple times unlike honeybees whose stingers are barbed and pull out of the bee killing it. The queen will now start laying the second brood cycle which is much larger and more numerous-up to 60 or so cells. In the next month the nest will go from the size of a baseball to scockerball size. The second brood adults will be much larger than first brood but not quite as big as the queen. This nest (p exclamans) now has four capped cells (pupae) and about 15 cells with larva almost ready to spin their caps. Once capped it’s from 3 to 6 days before the adults emerge. May 18 saw the first larva capping over. That means the pupae will be transforming into an adult wasp that will emerge in about six days.